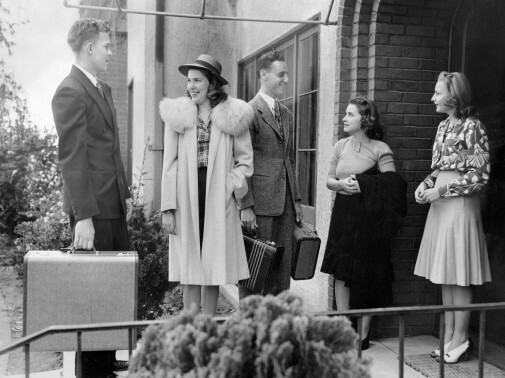 Westmont students move into campus housing in 1941. Photo courtesy of the Westmont Archives. 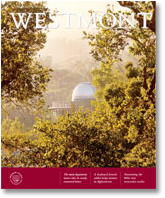 Established as a residential college, Westmont faced challenges housing students during its first few decades. Despite some unusual living spaces, the college succeeded in creating a vibrant campus community. Ruth Kerr, Westmont’s principal founder, purchased the Westlake School for Girls in Los Angeles in 1939. The five-acre property boasted only six buildings, one of which served as a men’s dormitory. Kerrwood Hall held administrative offices, classrooms, an auditorium, a dining room, a kitchen a student union—and housing for women. The college soon outgrew this campus and noted the need for better student accommodations in its search for a new location. The college found a men’s dormitory through neighbors. “Mr. and Mrs. Klingler. . .offered us their estate at a figure that required only a small down payment with liberal terms on the balance,” Kerr recalled. “They had observed our students closely…and because of their high caliber felt they were a real asset to the community….” Men moved into Catherwood Hall. In 1947, the college acquired a 40-acre estate on Ashley Road, and women left Jefferson for the large, lovely home on the property. For 23 years, Emerson Hall housed students and a variety of college events, including graduation. Q-ville, a group of World War II Quonset huts, sheltered a privileged few male students in Westmont’s most curious “dormitory.” Men and women lived in somewhat primitive conditions in the Cold Spring Units: women in Unit I (later the Art Center and now the Music Building) and men in Unit III (now Reynolds Hall). These former Deane School dormitories date to the early 1900s. In the 1950s, residences bustled with activity—except during the early evening when quiet prevailed for studying. When they weren’t enjoying conversation by the fireplace, students liked to unwind in Kerrwood Lounge, gathering around the piano for sing-alongs after dinner. Later in the evening, after lights went out, women might hear the strains of “You Are My Sunshine” as a group of male students with a ukulele serenaded them outside their windows. The first two major facilities Westmont built served the residential program: Page Hall (1959), which housed women, and the original dining commons (1959). Van Kampen Hall (1963) began as a men’s residence, and women lived in Deborah Clark Halls (1965). Westmont brought all students on campus and into traditional housing by constructing Armington Halls (1970, 1974). When enrollment grew to 1,200, the college added a residence hall in 1984. Known for years just as New Dorm, it became Everest Hall in 1997, being at the top of campus, and, finally and formally, Emerson Hall in 2002. Over the years, wildfires have destroyed four residential buildings: Catherwood Hall in 1964 and three Clark Halls structures during the 2008 Tea Fire. Newly built Clark Halls absorbed the students from Catherwood, and the president’s house sits on its site today. The college rebuilt all the Clark Halls structures in less than a year. 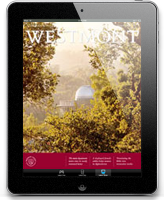 As higher education moves to minimize the residential student experience, Westmont seeks to strengthen this vital aspect of an effective and transformative education. The college’s student life program and activities continue to revolve around campus residences.